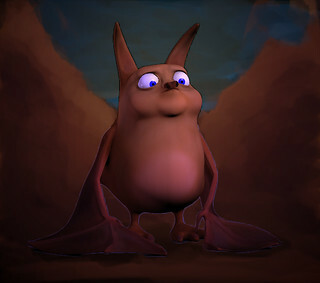 FatBat DynamicWingDemo from naweed Khan on Vimeo. This a demo of a wing setup I’ve created for this Toony Bat Character. It makes use of a technique described by Zeth Willie. An ikspline joint chain is setup, where the curve is driven by either a manual control setup or a dynamic control setup, the user can blend between the 2 in order to achieve a hybrid of keyframed and simulated animation. …Someone should write a script to do this! okay… I’ll add it to my list of things I might get around to doing when I’m not staring at pixels! This entry was posted in animation on 21/02/2014 by Naweed1979. Here’s a breakdown of a wing flap technique I’m exploring for Fat bat’s wing setup. 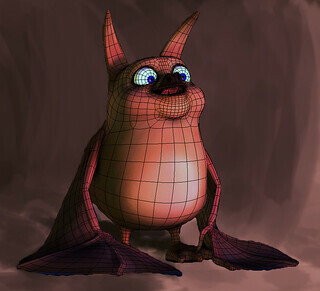 This allows a skinned mesh to manipulated by an animator, this mesh can then be plugged into a nCloth mesh via a blendshape. In The nCloth Dynamics you can set ‘input attract’ to 1 and paint where the mesh is attracted to the Input Mesh. Black areas are not attracted to the input Mesh so this inherits the cloth simulation. wing flapping – n-cloth from naweed Khan on Vimeo. This entry was posted in animation on 06/02/2014 by Naweed1979. 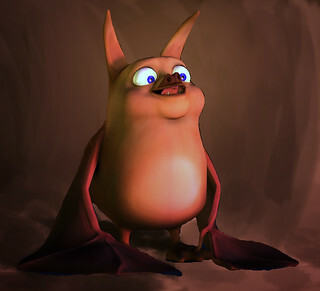 FatBat comes alive that little more….a few quick lighting tests and Photoshop painting. ‘Lighting’ used loosely here, I used viewort 2.0, a screengrab then did some quick backgrounds in photoshop, hence the bad masking! Went a bit Napolionic on this first one. This entry was posted in animation on 31/01/2014 by Naweed1979. 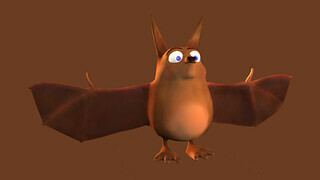 A short flight cycle to test the fat bat rig, took about day to rig and animate. My rig tools are coming in a lot more useful these days. FatBat wingCycle from naweed Khan on Vimeo. This entry was posted in animation on 28/01/2014 by Naweed1979. ….And FatBat comes to life a little more, here are expressions drawn over the model to get a sense of how he might look when bought to life. .…and here’s the full body as it stands, a few kinks, though I’m generally happy with his look, cute and appealing was the goal. This entry was posted in animation on 22/01/2014 by Naweed1979. I’ve been doing a lot more Photoshop drawing in recent weeks, some bad, some not so bad. It’s a nice break from the technical world or python and rigging. It’s nice to just throw down shapes and colour and just start seeing what happens, there’s a great freedom in doing so and a lot of fun on the way to discovering new concepts and ideas for stories and characters. Here are some results, with brief overview of my thought process. 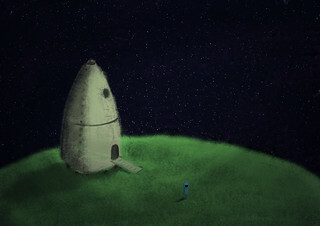 I had no idea what was going to happen here, all I knew was that I wanted to create something with a rocket in it, so I started with the ground, threw in the sky and the rocket…..then I thought, it needs something else, so I roughly drew out some shapes to represent the astronaut, I kept really simple and voila, an image I was moderately happy with. Well, inside I was really happy with it, uncomplicated shapes, warm colours, and all with minimal effort. I wanted to draw bats, To loosen me up one morning, I just painted out some random shapes with a big white brush on black, I then went in with an eraser and just etched in silhouettes, a really nice way to find some unexpected shapes. 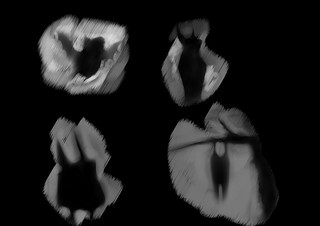 I wasn’t thinking detail, just bats, the one on the bottom left, was already in mind and is developed on below, but all the rest, they just popped out of the initial painted shapes. 3. 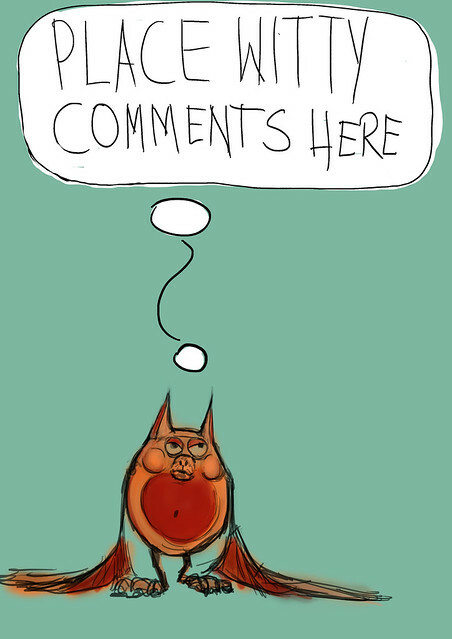 The Fat Bat comes to life…. 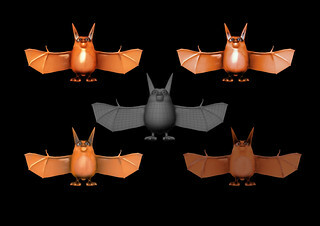 A few days of doodling and this model popped up, not much to say here, but I knew the bat on the bottom left(from above) had an appeal about its posture and shape, and this was the character I most warmed too, so after an initial doodle for some colour and concepting, I moved onto the model, and here he is, nameless but otherwise a fat bat, that has evolved through a really fun creative processes. All he needs now is a story…. and an animator willing to bring him to life….okay, I’ll get around to doing it soon, I promise! This entry was posted in Gallery and Stills, inspiration, workflow on 21/01/2014 by Naweed1979. This was built for an assignment during the advanced rigging workshops taken with puppeteer Lounge. The muscle objects are simply added as influence objects. A very nice method for maintaining volume and getting quick squash and stretch behaviour. Maya Muscle Rig from naweed Khan on Vimeo. This entry was posted in animation on 06/01/2014 by Naweed1979. Some fun in Z Brush…. This entry was posted in animation on 17/12/2013 by Naweed1979. Here are some variations of a female head. all using the same topology, I took it into mudbox and played around with a little and here are some of the results. Initially I started with dynamesh in ZBrush, and just started sculpting, using my Pinterest boards a lot for reference, great resource. I then did a retopology using a combination zRemesher and maya. This entry was posted in animation on 09/12/2013 by Naweed1979.